The Air Force Office of Scientific Research (AFOSR) will host its annual Spring Review this week from March 4-9, 2013 in Arlington, Virginia. As a directorate and vital component of the Air Force Research Laboratory (AFRL), AFOSR manages the basic research investment for the United States Air Force. AFOSR program officers identify and fund long-range technology options at intramural, university and industry laboratories and ensure the timely transition of research results to improve warfighting and peacekeeping capabilities. The event represents the 56th formally designated annual assessment of AFOSR’s research portfolio. Program officers will discuss research projects funded over the last year and provide insights, trends and plans for the future basic research programs of interest to the Air Force. 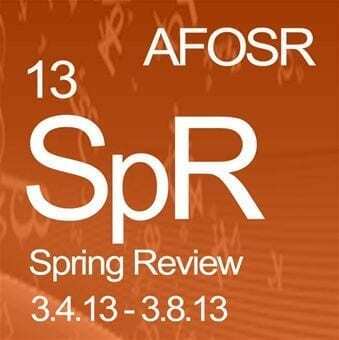 The public is invited to access a live stream of AFOSR’s annual Spring Review, available here. AFOSR is headquartered in Arlington, Va., with smaller global locations in London, Tokyo, and Santiago to facilitate international research efforts. AFOSR research areas are organized and managed in three scientific directorates: Aerospace, Chemical and Material Sciences; Mathematics, Information and Life Sciences; and Physics and Electronics. The organization has funded over 1200 extramural research grants at universities as well as many small business projects.